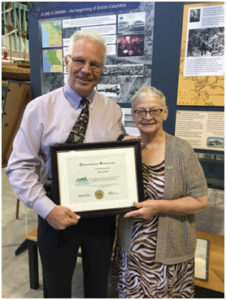 The Association of BC Land Surveyors presented BC Farm Museum volunteer and librarian Hilary Ruffini with a Certificate of Appreciation for the excellent work she did preparing and presenting a pictorial history of land surveying in BC up to 1914. The exhibit was titled Hard Lines. 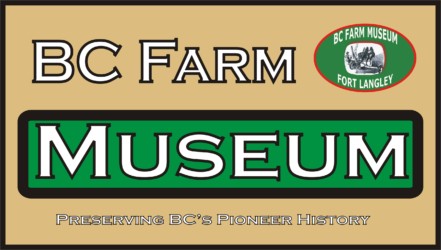 The presentation was made by former Surveyor General and current secretary of the Land Surveyors Association, Mr. Chuck Salmon, at the BC Farm Museum in Fort Langley where the exhibit is displayed. Many retired Land Surveyors attended the presentation as did Farm Museum volunteers. In his presentation Mr. Salmon quoted a number of fellow association members. Definitely a well deserved award!